Add your institution to the book! 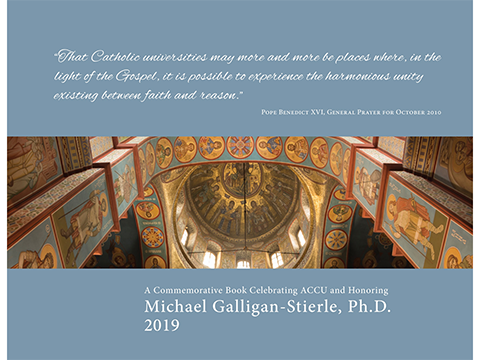 Welcome to the website of the Association of Catholic Colleges and Universities, a voluntary association founded in 1899 by 53 delegates from Catholic colleges throughout the United States. Since then, the Association has grown fourfold to represent more than 90 percent of accredited Catholic institutions of higher learning in the United States, plus approximately two dozen international universities. The president/rector of each institution serves as its voting member. ACCU’s location in Washington, DC facilitates productive partnerships with the United States Conference of Catholic Bishops, the National Catholic Educational Association, and various other national Catholic agencies, just as ACCU’s residence at the National Center for Higher Education supports collaboration with other higher education associations. ACCU also works cooperatively with the secular and religious press to secure meaningful and accurate coverage of Catholic higher education. ACCU’s principal purposes are to help member institutions strengthen their stated Catholic mission and to foster collaboration among Catholic colleges and universities. We welcome requests, suggestions, and opportunities to fulfill this purpose in creative, cost-effective ways. This site offers a number of resources for your use. If I or other members of the staff can assist you, please do not hesitate to call upon us. The best days of Catholic higher education lie ahead! All presentations are copyrighted by ACCU; unauthorized reproduction is strictly prohibited.